The Hemerocallis species are of interest to people who wish to know more about the history and development of the daylily. Many species have unique characteristics and an understated natural beauty that lends themselves to centerpiece plantings, cottage gardens and more. One mostly overlooked aspect of daylilies, including the species are their culinary, nutritive and medicinal value. Daylilies have been used for centuries as a source of food and medicine. Almost all if not all part of the daylily can be eaten. There is some indication of adverse effects of the leaves in some people, primarily severe diarrhea but it may be related to quantity, age or preparation of the leaves. There is no indication that daylilies (Hemerocallis) are poisonous in any way. Hemerocallis species have some issues as to true identification. The various species interbreed very easily and can produce offspring which are similar to the parents but with differences in bloomtime, shape and color. The daylilies described on these pages are our best guess as to species types. Some of the species originated from Dr. George Darrow, others were acquired from additional sources. We are constantly looking for new species or new sources for some of the same species in order to verify the true identity of the species. There are some species which we can't grow here in Vermont as they are evergreen and do not survive the winter. Other species such as H. sempervirens and H. lilioasphodelus are slow increasers but survive the winters just fine. There is also a daylily species named after Dr George Darrow. its is called Hemerocallis darrowiana. It has never been grown in cultivation and is only found on the Sakhalin Island which is north of Japan. For further information, a good source of original information is A.B. Stout's book, Daylilies, originally published in 1934, it was reprinted in 1986, by J.M Dent and Sons, London. A more up to date reference is The New Daylily Handbook An updated anthology based on the classic 1968 Am. Hort.Soc. Daylily Handbook republished by the Am Daylily Soc. in 2002. Hemerocallis sp. in its native habitat in Japan. Coexsisting with various other herbaceous plants on presumably what is a seaside meadow. It is not clear which species this is though. Hemerocallis (hem-er-o-kal-lis), the botanical name for daylily means in Greek ''beautiful for a day'. Each flower only opens for one day. After it is spent, it is succeeded by the next day's blossom. Established clumps bloom vigorously for weeks and weeks. Hemerocallis citrina (right) next to a large Tetraploid hybrid cultivar.Note the different characteristics between the two types. The daylily is a monocot related to Orchids, Hostas and Grasses. Daylilies were originally thought to be in the the Lily family (Liliaceae) but are now placed in their own family Hemerocallidaceae. and are in the genus Hemerocallis . Daylily species were originally found in Manchuria, Mongolia, Northern India as well as throughout China, Japan and Korea. In their natural habitat daylilies are found in swamps, seashore meadows, forests edges and on mountains up to 10,000 feet. While there was some hybridizing of daylilies in the early 1900's however it wasn't until the 1930's when Dr. A.B. Stout ( New York Botanical Garden link to A B Stouts's archives) began to working with daylilies, hybridizing and identifying the species that they really took off. Dr Stout did extensive breeding work and developed dozens of hybrids. Since then daylilies have become nearly as popular as roses. They are collected, grown and hybridized by people around the world. It is amazing to think that from approximately 20 species of daylilies over 65,000 varieties of daylily hybrids have been developed. While the colors of most species are orange, yellow or rarely pinkish there are now daylily hybrids in shades of red, purple, near white and more! With so many daylily varieties to choose from why would one want to grow daylily species? Besides the historical interest of growing a species there are many traits that makes a species desirable. First and foremost in our opinion is the simple natural lines and form that species exhibit. The trumpet or simple star shapes of the blooms, the graceful narrow foliage and the loose growth habit of many of the species is delightful and fits into most landscaping designs. Secondly as plants that have evolved over millions of years they contain potential adaptability that may not be present some of the more modern cultivars. Finally from a breeding standpoint the species may contain genetic material that could produce new yet undiscovered traits. Usually the earliest daylilies to bloom. This yellow daylily has scapes only 10-12 long, 3" star shaped blooms and low grass-like foliage. Hem. minor seems to have a relatively short bloom time as well lasting only about 2-3 weeks. Hemerocallis minor foliage: Notice the small short bracted scapes. Hemerocallis dumortieri is frequently one of the first daylilies to bloom here in Vermont. We have also noticed that this is one of the most fragrant daylilies, surpassing Hem. lilioasphodelus. Vigorous and exteremly hardy this species blooms early and well for us regardless of the winter and spring conditions. The red backed sepals add the the attractiveness of this plant. Foliage is blue-green and noticeably spikey. Hemerocallis dumortieri: star shaped golden yellow blooms 4" across are produced on 26" scapes. Hemerocallis middendorfii is particularly notable for it's fast increase and strong bloom early in the seaon. blooming reliably en masse, with flat golden blooms in early June here in Vermont. Foliage is a plain green. A profuse bloomer, H. middendorfii puts on a splashy show in June. Somewhat less spikey and distinctively spring green coloration. Wavy edged squat bracts are very characteristic of H. middendorfii. These illustrations from the Am. Hort. Soc. show both growth habit and the characteristic short bract. Amazingly adaptable and a vigorous competitor, we have it growing in semi-shady spots with ferns. The so-called Lemon Lily this daylily species is also quite early although consistently blooming after Hemerocallis dumortieri and Hemerocallis middendorfii. The color is a clear lemon yellow and has a distinct fragrance. Hemerocallis lilioasphodelus has a somewhat stoloniferous spreading habit but is a slow grower here in Vermont. One of the first daylilies introduced into the U. S., it is sometimes found near old abandoned cellar holes, a testament to daylily's longevity. Less clumping than the other early blooming Hemerocallis species, the foliage is blue-green and spikey.Hem lilioasphodelus is not particularly vigorous and so creates loose clumps. seems to prefer a damper location as well. Interestingly the Am Hort Soc illustration seems to indicate a more clumping plant than we have seen here at Olallie Daylily Gardens. Hemerocallis flava 'Major is supposedly a larger type of Hemerocallis lilioasphodelus. Blooms are larger with more substance. H. flava 'Major' has larger denser foliage that grows into clumps with no spreading habit. No real noticeable fragrance either. Commonly known as the Orange Roadside Lily, the Ditch Lily or even Tiger lily is probably the best known daylily in the U.S. if not the world. With an aggressive spreading habit and tall showy orange blooms, it never fails to make an impression. 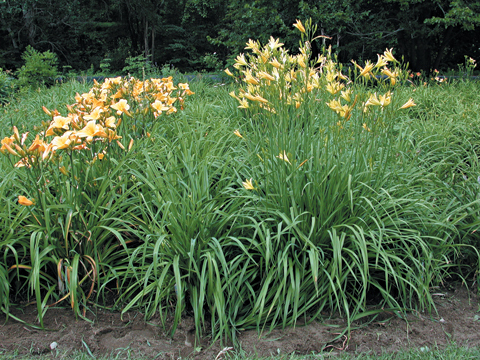 This daylily is frequently considered a weed, but planted in the right location, this plant can outcompete other weeds and/or act as an erosion control. H. fulva was the first daylily to be imported into Europe and then America from China. An Am. Hort Soc. illustration clearly showing the running habit of Hemerocallis fulva. Hemerocallis fulva 'Kwanso" is a spreading variant with double blossoms. The spreading habit is the same, but the bloom time is a little later. The extra petals, made up of the sepals can make for a frilly show! Below is the rarer variegated version of "Kwanso'. Sometimes the new shoots of a variegated clump's leaves can revert to all green and so the all green shoots must be removed in order to retain a variegated stand, as the variegated fans are less vigorous that the all green fans. Oddly the majority of Hemerocallis fulva found worldwide (I believe) is a sterile clone. As a Triploid it is not self compatible. Rarely a seed pod is produced through a series of unusual and rare events. Dr A Stout, through persistence was able to produce some H. fulva hybrids. These hybrids are much like H. fulva in coloration, bloomtime and growth habit, but none have the spreading rhizomatous habit. Linda: A pale version of a H. fulva hybrid. This cultivar is a very vigorous grower, much like H. fulva. Baghdad, a more subdued orange-red mix. An unknown H. fulva hybrid type of unknown origin growing here at Olallie Daylily Gardens, this hybrid does have a spreading habit. Hemerocallis hakuensis begins blooming in early July here in Vermont. H. hakuensis produces numerous orange-yellow trumpet-shaped blooms. Good growth and high seed set are characteristic of this species. H. hakuensis can produce up to 35 buds per scape and blooms well into August. Vibrant green clean dense growing foliage is characteristic of H. hakuensis. Hemerocallis altissima like most of the Hemerocallis citrina complex is tall and vigorous and seems to be very disease resistant. Hemerocallis altissima produces lemon yellow blooms on scapes up to 5-6 feet tall. The H. altissima pictured here was originally from Dr George Darrow. Hemerocallis altissima scapes are extremely straight, with upward facing blooms. The spent scapes can be quite persistent as is evidenced by this photo which shows last years scapes, amongst currently blooming scapes. The foliage of Hemerocallis altissima is a pleasing deep green. Also called the Citron lily has a lemony scent and is nocturnal. Flowers open late in the day and remain open through midday the next day. Trumpet shape,lemon yellow spider-like blooms are typical of H. citrina. Here H. citrina blooms along with Geranium 'Johnson's Blue", July 8, 2007. Vigorously growing, with immaculate foliage. H. citrina types can grow quite tall. Masses of late opening fragrant blooms appear in July and August. H. citrina roots are unusual as they mostly seem to lack the bulbous roots that the H. fulva types and other species exhibit. Hemerocallis citrina vespertina is an a variant of H. citrina and depending on the taxonomy is a subspecies or a seperate species. Extremely tall with wide branching it makes a wonderful show and has huge breeding potential. Hemerocallis citrina vespertina blooms from mid July into the end of August. The foliage of Hemerocallis citrina vespertina like all the citrina types is spikey, and blue green in coloration. The dead foliage is surprisingly resilient, as is evidenced by this image. Hemerocallis citrina thunbergii, appears virtually identical to H. citrina thunbergii but blooms about 2 weeks later and thus into September. A vigorous grower as are all the H. citrina types this cultivar also has lots of hybridizing potential. Hem. citrina thunbergii blooming late in August. Hemerocallis multiflora produces and unbelievable number of buds, upwards of between 40-80 buds per scape are possible. Hemerocallis multiflora with tiny 2.5-3" blooms will bloom well into September here in Vermont. The foliage is upright much like the H. citrina types. Hemerocallis multiflora is typically described as having orange colored blooms. This variant is more yellow and came from Dr George Darrow. Photographed from below, the enormous number of buds is evident. Buds are quite small as are the seed pods. The seeds are unusually small as well. Multiple branches are characteristic too it seems. Hemerocallis sempervirensis a particularly late blooming species, beginning in mid to late August here in Vermont. The coloration and spreading habit seem to indicate a relation to Hem. fulva. Hemerocallis sempervirens does not grow very vigorously in Vermont. But has survived the winter with no problem. Hemerocallis sempervirens foliage exhibits a somewhat loose spreading habit but doesn't increase as quickly and aggresively as H. fulva. Hemerocallis coreana is a relatively new acquisition. H. coreana does not seem to be a very vigorous grower or bloomer here in Vermont. This cross was obtained from J Halinar (CA). This hybrid of Hem. citrina and Hem. hakuensis exhibits some of the characteristics of both species, the lemon yellow color of H. citrina and the trumpt shape of H. hakuensis. A Tetraploid derivation of H. citrina with many of the characteristics of H. citrina.